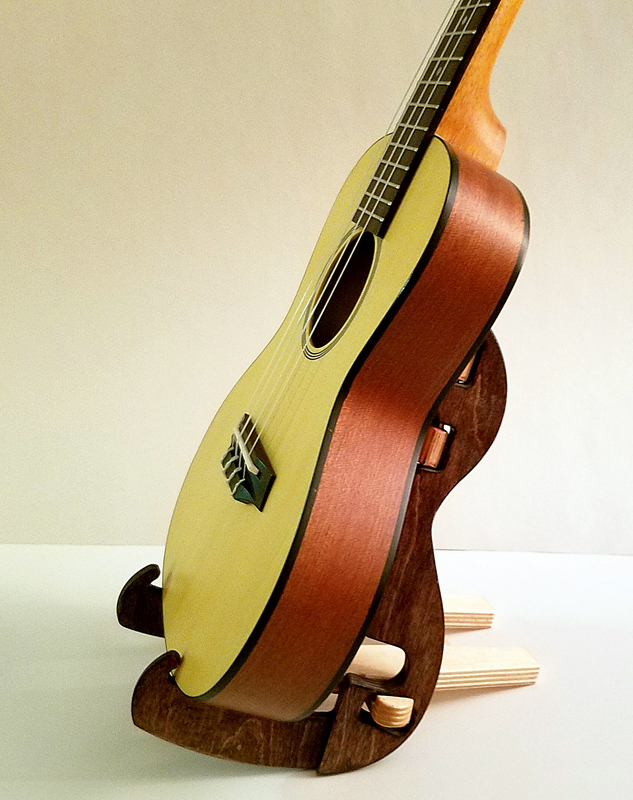 Carol and Keith Kimura's “K-Stand” is the take-along solution for guitarists and ukulele players. Until a year ago, Keith and Carol Kimura never expected to launch their own business. Carol had worked for over 30 years in the aerospace industry before becoming a teacher, and Keith had worked in aerospace and graphic design before gaining his current position in customer relations at a nearby resort. Each had already lived a full life before marrying each other, children, grandchildren, childhood in Hawaii, childhood in Gardena, family expectations fulfilled, family expectations fallen short of, college courses, artistic interests in dancing and music, artistic interests in design, job promotions, job layoffs, endings and beginnings, dreams and memories almost too numerous to recall. Their product, the K-Stand, is much like the couple themselves – many parts coming together like pieces of a puzzle to fit perfectly. The sleek and flowing design follows the shape of the instruments it is designed to hold, an ukulele or guitar. At first glance the K-Stand might appear to simply be a wood sculpture of a guitar, but its aesthetic appeal is actually just the beginning. In a few steps, the slim piece folds out to become a sturdy instrument stand and the flat-lying design allows the K-Stand to be placed inside a soft carrying case or “gig bag” so that the musician can always easily store and keep the stand nearby. Carol Kimura even thoughtfully added a soft, flannel case for each K-Stand to prevent any possible scratches or dents. The evolution of the K-Stand from a handmade Christmas gift to full-fledged product didn’t happen overnight and the system to create every K-Stand their company CKDream now sends out to excited customers holds true to the meticulous process that created it. As they tinkered with a way to recreate Carol’s K-Stand for others, their learning process led them to favor a labor-intensive approach, particularly after looking at the history of Japanese guitar company Takamine. A guitarist Keith sought feedback from introduced him to Takamine, a company that grew during the rise of folk music’s popularity in 1960s Japan for making quality, affordable acoustic guitars and is perhaps most recognized worldwide for its contributions to pick-up technology. While Takamine now has global recognition, like K-Stand, it started as a humble, family-run workshop. Similarly, K-Stand also brings new ideas to the industry while keeping in mind the needs of musicians. 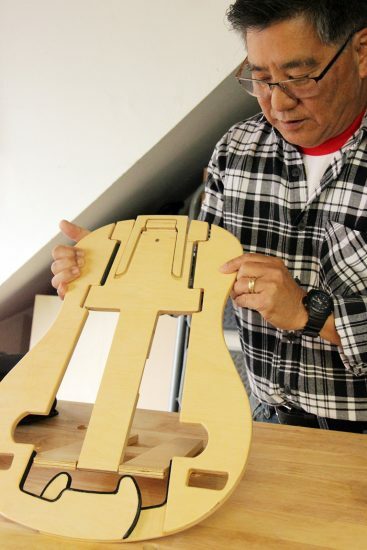 Keith created many first versions of K-Stand, listening carefully to his friend’s ideas to improve the design. Carol, a budding musician herself, started learning ukulele a year ago under her kumu (a Hawaiian term she translates as “a teacher and very respected person”) Randy Chang and his son, Josh. She loved the K-Stand and encouraged her husband to bring it to others, but also helped to urge his process along. Finally, the tweaking process came to an end and CKDream brought K-Stand to its first customers. Orders came in right away after debuting at the Kaulana Craft Fair in Torrance in December 2018 and the Slack Key Festival in Redondo Beach from this past January. The Kimuras’ garage has steadily shrunk in storage space as stations and equipment for the K-Stand assembly line grow. Unsure of what to expect at first, the co-owners of CKDream decided initially to have only samples at the events and take orders. Customers appreciate the care and service of the fledgling company and have not let the wait deter their orders. Now with future events scheduled, Carol and Keith hope to build an inventory and be able to sell K-Stands in person. Their agility in constantly adjusting their process has been an asset, as they figure out ways to constantly improve their efficiency without sacrificing any quality. Although they’ve maximized their workspace and invested in equipment, there are still limitations that require constant problem-solving. Although Keith loves the idea of working with solid wood, its varying thickness wouldn’t work with the design unless he had a planer sander. He found that by using furniture- grade Baltic Birch plywood instead, he was able to recreate the design easily and get the quality he wanted. Hand-carving every single piece was not an option for a customer version, so he learned how to use a CNC (“computer numeric control”) machine, which allowed him to set a tool path and cut sheets of wood. Now at the center of their workspace, the CNC is a bona fide addition whose crisp whirring and robotic click sounds tell you this is an everyday garage no more. With a Wall-E-esque helper by their side doing half the work, the couple was able to get CKDream off the ground and create K-Stands for others. However, just because the machine does so much doesn’t mean Keith and Carol get to take a break — outside of their day jobs they devote nearly all their spare time to all the other things that need to be done. Keith assiduously monitors the CNC to ensure that the moment the drill bit wears down and creates fraying that it is replaced. And although the machine cuts precisely, Carol hand-sands all of the pieces multiple times, rounding the ends and smoothing all pieces before and after Keith varnishes. What began as a small, quiet woodworking project has now evolved into a microcosm of a factory floor staffed by only the dedicated couple and their new robot. Due to the amount of noise wood-cutting creates, Keith operates the machine only at certain hours of the day and built a small structure around the wood-cutting area to reduce the sound out of consideration to their neighbors. With plans to launch a Kickstarter this summer, the company hopes to be able to move to a commercial space where they can have more machines, more production capacity and continue to improve their tooling and process. An expansion would also mean they’d be better equipped to launch more designs, new sizes, new instrument styles and even work with different materials one day, such as solid wood, metal, carbon fiber and plastic. For now, however, they’re just trying to keep up with the demand and ensure every K-Stand is crafted with as much as love as the very first. 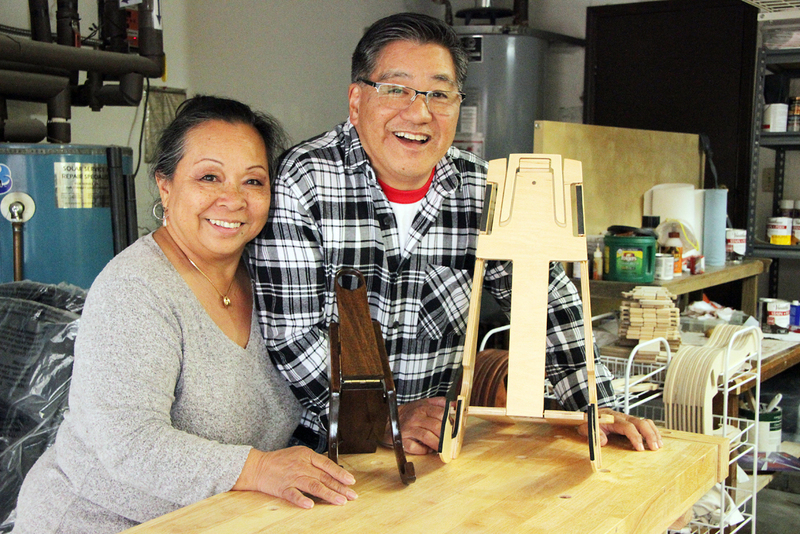 You can check out the K-Stand in person at the Heritage of Aloha Festival, Saturday, May 18, and Sunday, May 19, in Santa Fe Springs. To place an order online and sign up for K-Stand’s updates on the launch of their Kickstarter project, visit their website at www.k-stand.com. Follow them on Instagram at https://www.instagram.com/kstand2019. Keith and Carol Kimura are two-time graduates of the Entrepreneur Training Program (ETP) organized by the Little Tokyo Service Center (LTSC) Small Business Assistance Program and made possible with the support of the Asian Pacific Islander Small Business Program (API-SBP), Small Business Administration (SBA) and Gardena Valley Japanese Cultural Institute (GVJCI). These workshop training series cover a variety of training topics for any entrepreneur planning to launch their own small business. LTSC offers these 24-hour trainings three times a year in both English and Japanese around Los Angeles County.